A drug proven to reduce deaths in children suffering from severe malaria must be immediately rolled out in African countries. Geneva, April 19, 2011—After the revision of World Health Organization (WHO) guidelines yesterday, international medical humanitarian organization Doctors Without Borders/Médecins Sans Frontières (MSF) calls for a drug proven to reduce deaths in children suffering from severe malaria to be immediately rolled out in African countries. In its new report Making the Switch, MSF calls on African governments to follow new World Health Organization (WHO) guidelines, and switch from the far less effective quinine to artesunate treatment, which could avert nearly 200,000 deaths each year. MSF also calls on WHO and donors to support governments so this urgent treatment change can happen quickly. Quinine has to be given three times a day in a slow intravenous drip that takes four hours, a treatment that is burdensome for both patients and health staff. Artesunate, in contrast, can be given in just four minutes through an intravenous or intramuscular injection. A landmark clinical trial in late 2010 concluded that the use of artesunate to treat children with severe malaria reduces the risk of death by nearly a quarter. The study, carried out in nine African countries, found that for every 41 children given artesunate rather than quinine, one additional life was saved. Because of the complexities of administering quinine, children in the trial who were assigned to receive quinine were almost four times more likely to die before even receiving treatment. MSF participated in the trial through its research affiliate Epicentre with a research site in Uganda. MSF has since changed its own treatment protocols and now plans to work with national health authorities to roll out artesunate in its projects over the coming months. The evidence is overwhelming, but MSF’s report stresses that change will not happen on its own. While WHO has now issued new guidelines recommending artesunate for treating severe malaria in children in Africa, it needs to also develop a plan to help countries make this switch. African governments must urgently change their treatment protocols and donors must send a clear signal to countries that they will support the additional cost where needed. Artesunate is three times more expensive, but the difference in cost of US$31 million each year for a global switch is very little for the nearly 200,000 lives that researchers say could be saved. 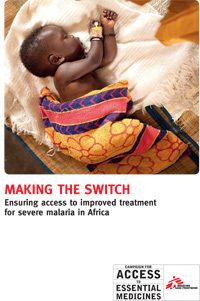 MSF provided malaria treatment to around one million people in 2010. Severe malaria kills more than 600,000 African children under the age of five annually. Each year, around eight million simple malaria cases progress to severe malaria, where patients show clinical signs of organ damage, which may involve the brain, lungs, kidneys, or blood vessels.